As everyone knows, Switzerland is famous for two things, well, three if you include tennis ace Roger Federer. The other two are chocolate and watches. 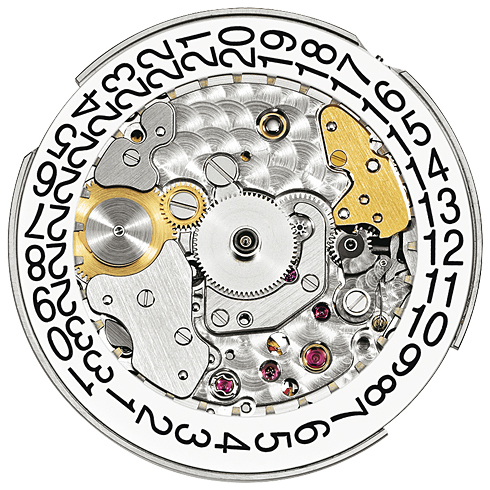 And so it is that perhaps the most respected name in watch making decided to produce the Ref. 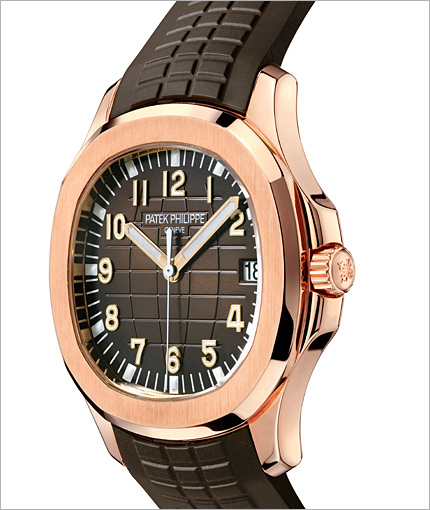 5167R Aquanaut Jumbo in Rose Gold with a delicious chocolatey colour and texture. 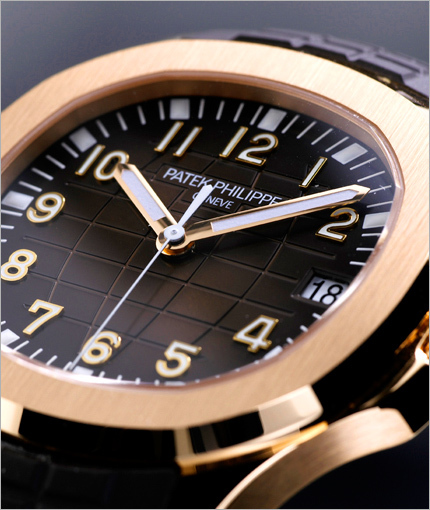 It looks for all the world as if the watch has just been unwrapped from its gold foil. 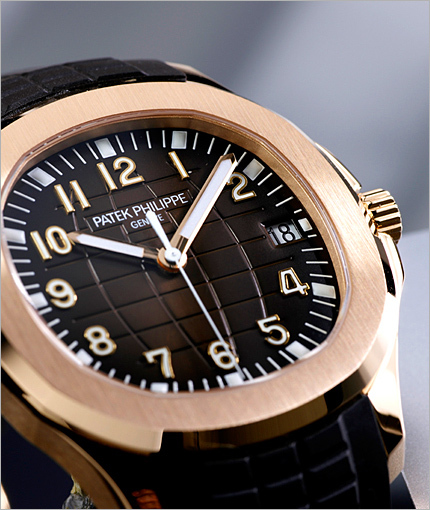 The Patek Philippe Aquanaut was first produced in 1997 as a facelift for the Nautilus. 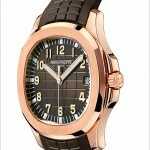 There are several versions of the Aquanaut including chronos and several different metal choices, but it will come as no surprise that the Jumbo is the largest model of all. The Ref. 5167 replaced the Ref. 5065 Aquanaut as the largest in the collection. 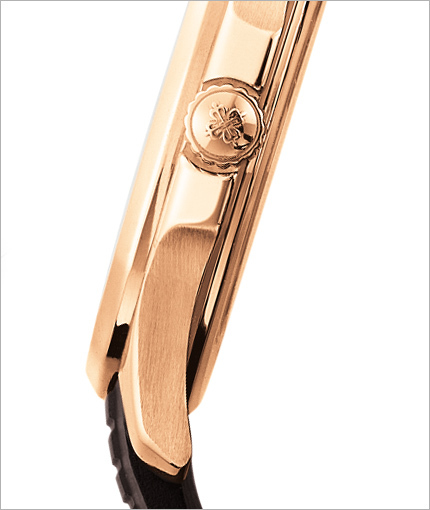 The chocolate dial and strap version in rose gold was introduced in order to commemorate its 10-year success story, and the extra large Ref. 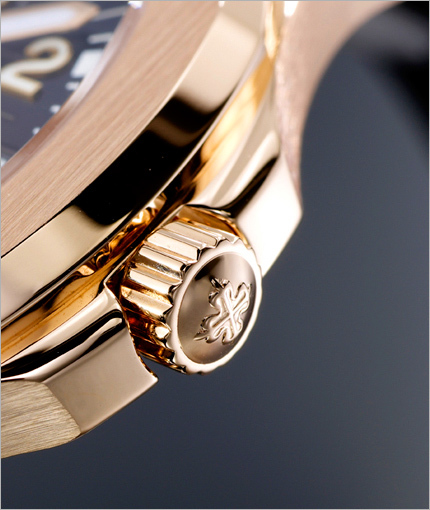 5167R Aquanaut was subtly refined in 2007. 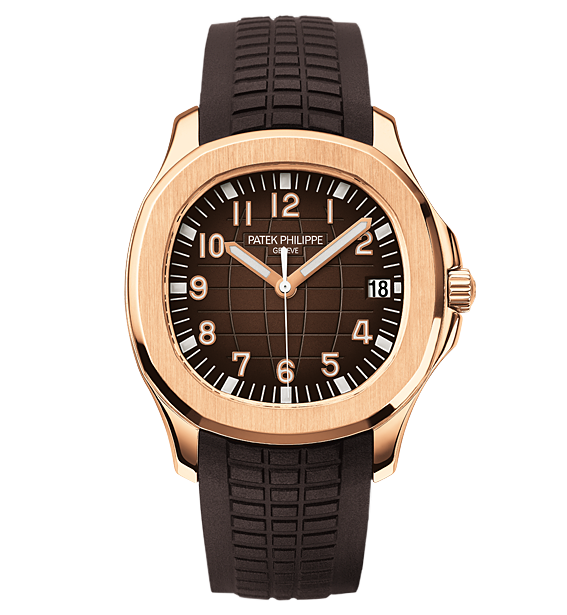 Beloved by many as the perfect dress sports watch, the Patek Philippe Jumbo Aquanaut is a model of casual elegance that combines customary Patek technical perfection with uncompromising performance and imaginative creativity in design. 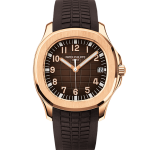 The original Nautilus, of which the Aquanaut is a direct descendant, was introduced in 1976. 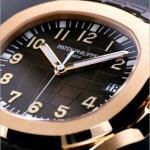 It was designed by one of the most gifted watch designers ever to grace the Swiss watch industry. 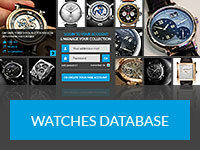 Gerald Genta, who was also responsible for the Audemars Piguet Royal Oak and the Omega Constellation among many other classic watches, claims to have designed the Nautilus and its famous port hole dial on a serviette while listening to Patek Philippe executives talking during a long Baselworld lunch. At the end of the meal he showed them the sketch. They were so impressed it went into production virtually unchanged – and in fact the design has not radically changed since that first sketch. The raised ‘chocolate bar’ surface of the dial is faithfully echoed in the high-tech hypoallergenic composite ‘Tropical’ strap. The strap is a composite in order to be resistant to saltwater immersion, UV deterioration and bacterial growth. 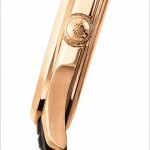 It’s designed to be cut for a comfortable custom fit and then fitted into the butterfly style folding deployment clasp. The complex yet seemingly effortless construction of the case features a screw-down crown for extra protection while playing sports, or indeed swimming or snorkeling as the watch has water resistance to 120 metres, the first watch with a see through caseback to rated to this depth. 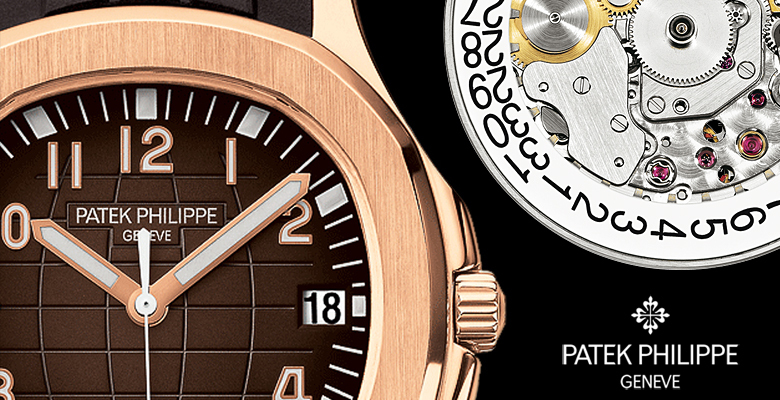 More resources about the Patek Philippe 5167R available on Official Patek Website.